whether you are at home OR traveling! It’s size makes it your perfect companion for quilting retreats or sew-ins! It has 4 temperature settings on a lighted digital control pad. We love how it heats and holds temperature in just seconds. It has 4 Iron head positions and the sole plate measures 2-3/8″ x 1-3/4″. The design of this iron allows you to get in to tiny places you wouldn’t normally be able to. And it shuts off automatically after 60 minutes. on the hunt for this little iron and now we know why. This would be awesome, I have a mini ironing board and would love this to go with it as my iron is too big and heavy for it! This would be amazing! I would love this for all the sewing days I attend! Oh awesome!! I’d love Electric Quilt 7 in my stocking! I really need this small iron to go in my crowded quilting space. I’ve had this on my wish list for quite some time. It certainly would come in handy when doing applique! Demonstrating at Art Shows would be so much simpler with one of these irons!! What an awesome idea. I badly need a new iron full stop. It would make those tricky corners and Heidie places to get at. Wonderful gift for a smooth, wrinkle free holidday. This would be wonderful! I often travel to friend’s homes for quilt days and this would come in so handy! What a perfect size for next to the machine oh and for PP and so many other things! Love this! I’ve been needing a mini iron for applique for a while. That looks great! My iron just broke so this would be a great gift from Santa to me! thanks! Santa should leave me this because I’m a clutz when it comes to big irons. I need something small that I can use and keep the big one for my husband. Thanks for the chance. Oh, Santa. I would love this little gem. I have a small ironing space next to my sewing machine and I keep hitting the wall with the tip of my iron as I pick it up and put it down. DH is not happy about that. This little baby would take care of that problem. Thanks for the chance to win. I am a follower. I have recently been taking my sewing “on the road”. A little iron like this would have been so handy! I would love to win so that next time I will be prepared. Thanks for the chance. I do a lot of miniature quilts and paper piecing so this would be great! I’ve tried several mini irons on the market but they just don’t seem to have much longivity. Would like to try this one….I like the style of it …looks as though it would be comfortable to use. Please Santa put one in my stocking this year. Oh, Santa, please put this iron in my stocking. I am tired of having to run into the other room to press seams. This means I could just iron my patwork as I go on my sewing table! fantastic giveaway, thanks! Santa should leave me this because I would keep it by my sewing machine and use it every day. I bet it would make my piecing much more precise and that would help me to not say or think naughty words! I would love Santa to bring this. I wouldn’t have to get up and go down the hall to iron my goodies. What a great iron, I have problems getting my huge one into small corners! Plus I have to get up every couple of minutes to go to my ironing board, which is not very relaxing! Oh Santa! Guess what I would love to see in my stocking! Dear Santa, I would love this iron because I love the stand that comes with it and the handle looks so comfortable to maneuver. Would love that, Santa. You are one thoughtful fellow! It would save me many steps as I tend to press a long hall away from the sewing machine. This would be the perfect iron for my portable cutting mat/ironing board combo. In fact, its already on my wishlist for the season! What a great luxury item! It’s something I would love to be gifted. I’ve heard about these but haven’t seen one – I’d love to have this for applique, and to sit next to my sewing table for quick seam pressing. And there’s just enough room for it in my stocking! Ironing and quilting go together and the small iron would be so practical. Santa Santa!! As a new quilter, this would be an Awesome gift to receive and a time saver. I have been looking for a portable iron like this for some time. I would love to find this in my stocking! Please Santa! Dear Santa, this certainly will fit in my stocking better than a standard iron LOL, but I think this would work wonders for my applique work and I wouldn’t be burning my ironing board and my fingers nearly as much. Santa this would make a great Christmas gift!!! I’ve started using my scraps and doing more with smaller pieces. This little tool would be great help! I have one similar myself santa but have a friend that really likes it, so I would give this gift to her I know she will be truly grateful. This would be wonderful to take with me when I sew away from home. Also, it would be great for tight places where the seams meet. Oh my gosh, this is on my wish list of quilting accessories! I’d love the chance to win! Dear Santa, please leave this in my stocking because I have just started to try my luck at applique quilts and this would make it so much easier. Thanks. I’ve always wanted to try one of these, and think they would be perfect for the little jewelry work that I do! I’ve been good Santa. I would love the little iron. It would be so handy!! This mini iron will be awesome to have to iron corners and hard to reach places when sewing purses. I’ve been nice! I’m new to quilting and can use all of the tools I can get to help me be successful with my projects. Thanks for the chance! I do lots of sewing that I need to iron small places….this would be so great to have…please, Santa. This iron is just too cool!! I don’t have a portable small iron–I’d love to find this in my stocking! Okay Santa, this is very cool…for a hot item that is! I really need one of these to take to classes and such! This would be such a great iron for traveling. I’ve spent some sewing weekends with friends and either the hostess doesn’t have a great iron or someone is hogging this. This little gem would solve both problems. I love to share. I think this little iron would be great to share with my friend Faye that is struggling with her applique. I have just gotten into applique and find my big iron to cumbersome for working on those fine little points. This would be wonderful under my tree! I would love for santa leave this litte iron in my stocking. It would work perfectly for all the new classes I’ve signed up to participate in. I would love this. I have a small house so this would help keep my workspace small and efficient. Oh Santa, please leave this in my stocking, I attend so many quilting retreats throughout the year that this would be an awesome gift and help ease my packing load. I would love a larger “mini” iron! The mini I have is soooo small…. I do a lot of appliqué and this would be great. Oh my goodness…I think this is exactly what I need. I have arthritic hands and the other irons are difficult to hold onto…but this one has a fuller handle and it would eliminate so much pain. I NEED this PETITE PRESS MINI IRON. Oh Santa, PLEASE! WOW – this little iron would be a fabulous item to take on the retreat I’m going on in January!! Pretty please, Santa???? My husband always steals my iron to press his shirts – I need my own iron just for sewing! I’m hoping Santa will leave me this gift because as a quilter it is exactly what I need for patchwork and applique. Hoping I win this one. I’d love to use this little iron at guild workshops! This iron is the perfect size for taking to my quilting group sew days. It would also be perfect to have by my sewing machine! Thanks for the chance! Oh what a cute and perfect little iron to have sitting right beside me while I quilt and applique! Yes, please Santa! This would be great in my stocking because I have a tiny sewing space and even less storage space. I could actually keep my iron with my sewing things! Wow. Oh wow. This would be so awesome for classes and retreats and sew days and paper piecing and… WOW!! This mini iron is on the top of my wish list. I sure hope I’ve been good enough this year! I’d love this in my stocking because so far I have no idea what Santa is bringing me….I wrote a list, but he didn’t reply yet…. This Iron would sure come in handy at quilt classes. Would you please stock this cute mini iron in my stockings? Thank you…. This would be wonderful for me to have. I’d be more apt to take more classes locally with this because I wouldn’t have to get up and down to go to the ironing board during class. My knees are both very bad and walking causes me great pain so having this accessible to me by my machine would make things so much easier. I have wanted one of these for a long time, so I’m hoping Santa will put this one in my stocking. I just don’t like dragging my big heavy iron out for some of the little pressing I need to do. It’s nice to have a small iron next to the sewing machine to press seams quickly. 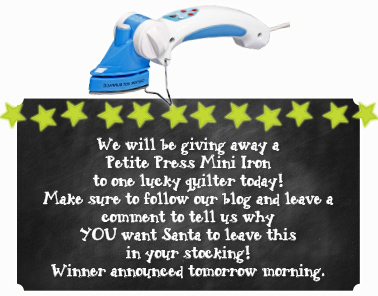 i follow your blog and would love love love this mini iron! it would be so nice to have next to my machine…or to take to my sit and sew where we sit crammed onto tables…would be fun to share it with all my local sewing friends! This would be a wonderful tool to have as I go South for the winter and it would fit nicely into my little sewing space. Perfect to carry to classes! Been wanting this for awhile now! I will be doing more paper piecing this next year – that iron next to my machine would be perfect! I’d love a mini to take to the quilt retreats I want to go to in 2013! That would sure come in handy for my Block of the Year applique project (yes – block of the year because that’s about how long it’s been taking me to do one block). This would be perfect for pressing right by my maching as I make my blocks. Thanks for the chance. OO this would be HANDY to have for those little projects we all get ourselves into! Its PERFECT. I love it!! I would love for Santa to drop this in my stocking this year. I want Santa to leave it for me on Christmas because not only have I been a very good girl this year but it would be very handy when I take classes! I would really really like to win this iron. I have seen it in person and have been looking high and low for one of them! If I don’t win I know where to tell my lqs to look for one! This would be awesome for retreats and sewing days. Thanks for the giveaway. This would be amazing. I have been looking everywhere for a small iron here in the UK without success. Yeah…I could use this at dining room table!!! If I won the iron, I wouldn’t have to go downstairs to press all the seams and I’d get more sewing done! My stocking would be thrilled! I want it for paper piecing. I would love this in my stocking! It would save from running downstairs to my iron all of the time! Oh Dear Santa this would make my quilting life soooo much easier…a new lease on ironing!! Oh I want this! I go to friends or classes all the time. Would be so convenient! Santa should put this In my stocking because it is rather wrinkled and I could use a new iron to fix that. Oh how I would love this mini iron for all of the quilt gatherings. I do a lot of turned edge applique using the starch method–this iron would be perfect for that technique! 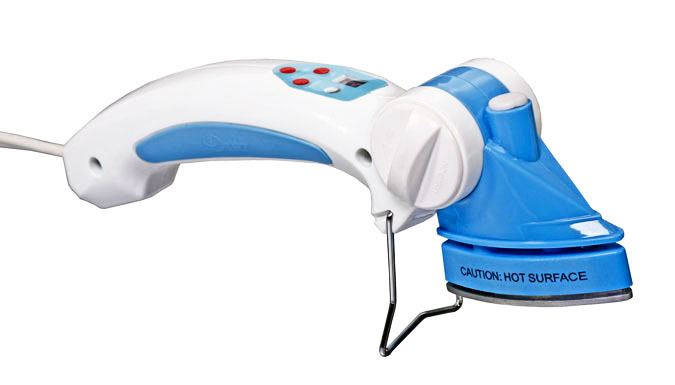 I keep getting the family iron gunked up with fusible… Santa will you please put this in my stocking? Who wouldn’t want that cool iron in their stocking ! Would love to have this iron next to me while sewing. Thanks for the chance. I have been looking for an iron to keep near my sewing table! This would be perfect! Oh, Oh, Oh, I need one of these…BAD, LOL! I tried the other kind and j=it just doesn’t get hot enough and this one looks perfect! Thank You and Happy Holidays!!! I would love the mini iron for pressing small applique pieces. Thanks for the chance to win. This would be great for applique and pressing small blocks and piecings. In addition it could go to quilt class with me! I would love this – so much easier than dragging out my regular iron to do just a small press job while sewing. I have a small iron but it doesn’t get into those tiny little places that this wonderful iron would – I need this iron. Wow! I did not realize how nice the mini’s were now. Been thinking about getting one, so when I have my surgery on my foot in a few weeks, I could still sit and sew. I have my sewing machine where I can turn to the right and cut, but this way I could turn to the left and press as well, without having to hobble across the room! 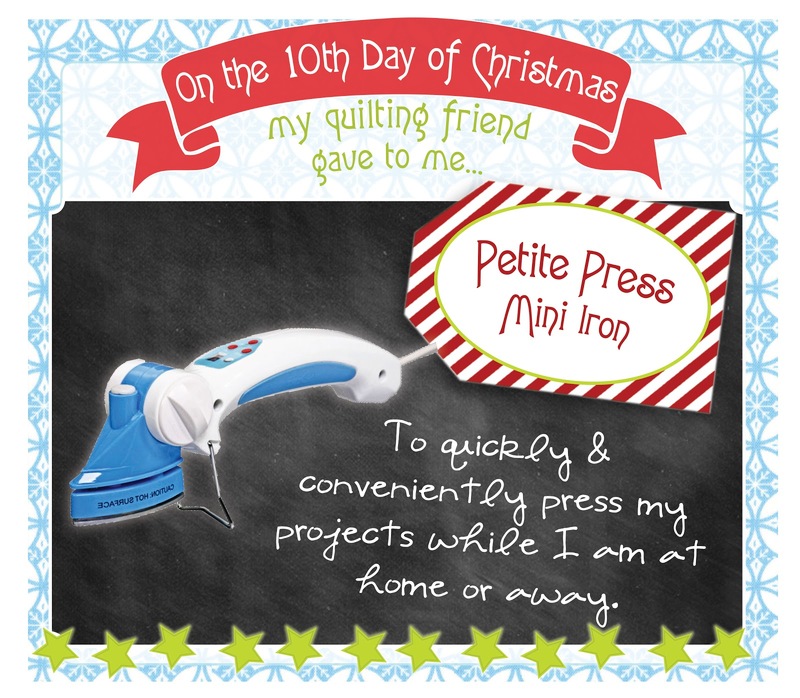 I’d love for Santa to leave me this adorable iron…it would make ironing the seams on those small bits of fabric so much easier (and save my fingers from burns)…thanks for the chance! My iron is a big old clunky thing. I would so love to have a sleek little one like this! I would love this in my stocking. So very nice! Ohhh! I’ve never had one of these and this one looks great! I’d be so happy to find it in my stocking :-)! A long time ago when I was very young, I can remember my Daddy making my Mother a miniature ironing board for pressing her seams which I have inherited…this iron would would work just perfectly with it! WOW! Santa, pleaseeeeeeeee! It is very handy. i LOVE this! i would like to try it and then offer it to my customers. I make sweet little rag dolls and quilts. This would be such a helpful tool for making them even sweeter! What a fantastic iron. It would be perfect right beside the sewing machine and handy to take to my weekly quilt gathering. I’d love to find one in my Christmas stocking. I would love to find this in my stocking~ it is the perfect size for working with applique pieces. Thanks for the great giveaway! What a great thing to find in my stocking! Lightweight, and small would make piecing a breeze! This would be great for retreats. What a great stocking stuffer! I need this in my stocking because it would be so cool to take to retreats!! such a nice, useful little gift! i’ve a small iron, but it doesn’t get hot and the cord keeps falling out. that has put me off getting another small iron. would love to win this one and give it a try. thanx for the chance to do so. I would love to try this product. I have been doing a lot of hand applique and the little iron would be great for pressing back that 1/4″ allowance. This would be ideal for the motor- home! I’d love to win this little iron. Right now my ironing board & iron are out in the hall, because there’s no room where I sew. But a small iron & ironing pad would work on the left side of my sewing table. Thanks for the chance to win. I love this little iron. It would be great to take to classes. I’d love this mini iron! I have a mini workspace so this would save me!! Thanks for the chances at winning so many wonderful treats 🙂 Happy holidays. Oh, SANTA!!! I NEED this wonderful little iron in my sewing room so badly! I have my mothers sleeve board-it is over 50 years old-don’t ask how I know!-in my sewing room to press my quilt pieces. I use a full size iron and it it just TOO big! I just HAVE to have one of these!! This looks like it would be a great iron to take to classes and retreats. Santa should leave me one because I don’t have a mini iron. Santa, I have wanted one of these mini irons for a LONG time, but haven’t been able to get one. I would love waking up to one in my stocking! I’m imPRESSED with the mini-rion, please pick me! this would be great for little projects! I have such a small sewing room. This would be amazingly convenient. I really look forward to seeing what you offer for the different days of Christmas. I love having the chances to win. Thank you very much. This would be wonderful to have to use with my mini ironing board that I have. This would be the perfect solution for me while I’m in my studio, as I don’t have enough room for a full size board and iron! This little iron is absolutely the perfect thing for my studio and to carry to my quilt bees and classes. I have a larger travel iron but it is quite bulky so I don’t usually take it along. I love to applique as you can see from my profile oicture. I NEED this. The iron is so cute! I can think of so many ways it would be useful. This will keep me in my sewing room, instead of running to the ironing board in the kitchen. This little iron is so cool! I would be able to piece and iron next to my sewing machine without moving to my ironing board. Sweet!! This iron looks like a excellent replacement for my tiny Clover iron (which I can still easily burn my little fingers). I’d love to see this in my stocking! Please Santa. I follow your blog and would like Santa to leave one in my stocking so I can iron my quilting seams easier! that is the cutest little iron i have ever seen. it would come in so handy in my quilting. thanks. What a fabulous little iron. I’d love to win this. Thanks for the chance. happy Holidays! I could use that mini iron for my applique. Thanks for the chance to win. What a neat tool! I’d used this to press those tiny spots the big iron wouldn’t reach. Thanks Santa! What a cool iron! I made a little pressing table to iron seams on that sits next to me and my sewing machine. This would be perfect for that little table. Oh Santa Please! As a new quilter, I would be delighted to have this as I build up my quilting supplies. Would you please leave this in my stocking, Santa? Isn’t that little iron just nifty?? Would love to have one to keep close by in my craft room! OH Santa!!! This would be so wonderful to have under the tree this Christmas!! My plans are to use up my scrap stash for 2013 and I would love to have this little baby sitting close by to help with the appliques and pressing!! I would like Santa to leave this for me because my regular (only) iron just gets so heavy that if I’m pressing a lot of seams, I have to keep stopping to rest my wrist due to arthritis. I think Santa knows that this would be a very welcome gift. I am a follower – Thank you so very much for this wonderful chance. This looks like a awesome tool and I would like Santa to bring one. Thanks! Oh Santa, please bring me this terrific mini travel iron. I am having to travel a lot on business and although I have my sewing machine with me, the hotel iron isn’t the nicest thing to deal with. I would so love to pack this in my suitcase on my next trip right after Christmas and still meet the airlines weight limits. Would love to win this iron ! Fabulous give-away. Thanks for this opportunity. So many times this would be just the thing to use, rather that the ‘big’ iron. Easy to take to class or pack for travel, too. I need one! Oh, I sure could use this! My iron of 30 years plus is about to go out! This would be perfect for ironing the inside of bags! Santa I want one! Hope it’s not too late to enter! My iron is on the fritz, so this would really come in handy! I would love to win this iron. It would be great for travel or to take to classes. Thanks for the giveaway.